Phoca Gallery is a full featured gallery for Joomla! CMS. With Phoca Gallery you can show your pictures in different categories and subcategories. Phoca Gallery does not display an image of the files stored on your server, but you decide what image belongs to which category. An image can also belong to multiple categories. With the multiple add function it is still possible to create a category from a folder on your server if you want to. The category can be updated that way too. Phoca Gallery creates 3 types of thumbnails to show the pictures. Those thumbnails are created with the help of the GD library (which you need to be enabled on your server). The smallest thumbnail is used when you display a list of categories. The medium thumbnail is used when you display the images in a category and the large thumbnail pops up when you click a medium thumbnail. Then you can also start a slideshow to view the images which belong to a category. Below is glossary where the Phoca Gallery terms will be used. The original image is used to create thumbnails from and a link can be displayed that visitors can display/download the original image. The advantage of using also large thumbnails is that you can add watermarks to your thumbnails, all large images are the same size (maximum). You can define the sizes yourself. There are a lot more features. See the feature list. With the Phoca Gallery component you can display the images from a menu item. It is also possible to display the images in an article. Then you need the Phoca Gallery component together with the Phoca Gallery Plugin. If you want to display a slideshow in an article you need the Phoca Gallery Slideshow Plugin. You can also display images or categories in modules. 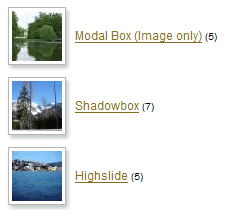 See then the Phoca Gallery Image Module, the Phoca Gallery Tree Module and the Phoca Gallery Menu Module. All these plugins and modules need the Phoca Gallery Component to work. To search with Joomla! search through your images, you need the Phoca Gallery Search Plugin. Categories View (or Category List Layout): this is a site where all the gallery categories (albums) will be listed. You can create a menu link to this view in Menu Manager. 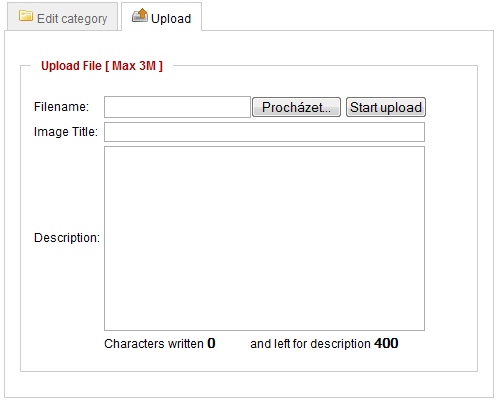 Category View (or Category layout, list of images): this is where all the images of a selected category will be listed. You can create a menu link to this view in Menu Manager but users can access this view through Categories View too (if user clicks on Category in Categories View). Map View: this is the same view as Detail View. Instead of images, Google Maps will be displayed. Pane: can be Rating Pane, Comments Pane, Statistics Pane, Geotagging Pane, Upload Pane. You can display panes below images in the Category View. User Control Panel: this is in the frontend where users can create categories (subcategories) and upload images into this category. User can publish, unpublish, delete or add images here. You can create a menu link to this view in Menu Manager. Parameters - Component: This is the Phoca Gallery Parameter section in a menu item. With this you can set parameters for one menu item only. This is a very important term (especially in the Phoca Gallery 1.x series). See this link for more information. Parameters - Component in Joom!fish: If you are using Joom!fish component for translating your sites and you will translate e.g. menu link to Phoca Gallery, you can change parameters for this translated. There can be set different as they are set in global configuration or in basic (not traslated) menu link to Phoca Gallery.